While I was on holiday, the chance arose to see James Cameron’s acclaimed movie Avatar in a large shipboard cinema, and so – although I hadn’t planned to watch the film any time soon- I grabbed the opportunity. And I’m very glad I did, even without 3-D glasses to admire the amazing special effects. It’s essentially an adventure story, with various classis elements. In 2154, a paralysed ex-marine, Jake Sully, replaces his recently deceased twin brother in a mission to distant Pandora, a mysterious place that has natural resource (the oddly named Unobtanium) needed by visitors from the dying Earth. Pandora is home to the Na’vi, and the idea is for Jake and colleagues to morph into avatars who are human-Na’vi hybrids, with a view to establishing links with the indigenous tribe. Jake falls for a Na’vi lady, and the tribe’s way of life, but this precipitates a furious battle between the incomers (led by a caricatured military hard man) and the natives. The messages of the script may be unsophisticated, and the script is at times banal – I can’t understand why you would spend so much money on spectacular visuals and then settle for tin-eared dialogue - but the action is engrossing. Even though the film is very long, I was never bored. Sam Worthington and Sigourney Weaver are effective in their lead roles, but the lasting memory I will take from Avatar is of Cameron’s brilliance as a film-maker. His movie is a fine piece of light entertainment, and literally wonderful to watch. Moon is an interesting science-fiction thriller from last year, directed by Duncan Jones – who turns out to be Zowie Bowie, son of the legendary David (who wrote that great song ‘Life on Mars’, of course.) The film stars Sam Rockwell as Sam Bell, while the marvellous Kevin Spacey voices ‘Gerty’, Sam’s robotic computer sidekick. Sam works for Lunar Industries, a company apparently doing good work for the climate, and is engaged on a three-year contract to work in splendid isolation (apart from Gerty) on the moon, mining helium. He receives occasional video messages from his wife Tess, who was pregnant when he left home and has now given birth to a daughter. Unfortunately, it soon becomes apparent that all is not as it seems, and that the company is (perhaps rather predictably) not the upright organisation that it is supposed to be. Sam starts to hallucinate, and before long he comes across an injured astronaut who turns out to be – himself. But which of them is the clone? This is a pretty good sci-fi movie, although the set is rather claustrophobic, and the action relatively limited, features which prevent it reaching the highest level and tend to reduce the tension. But it deals interestingly with the idea of what it takes to be human, there is genuine pathos in the later stages, and Gerty comes good in the end. Even if you are not a mad keen sci-fi enthusiast, I think you’ll find this film worth a look. I like this blog to range widely in the crime genre, and to cover ‘forgotten’ books and authors as well as the big names. One of the stars whose name I’ve rarely mentioned is Dashiell Hammett, but that isn’t because I don’t admire his work. On the contrary. I’ve just acquired, from an excellent Yorkshire bookseller, Mark Sutcliffe, a book edited by Christopher Metress, The Criticial Response to Dashiell Hammett. There is a lot of stuff in here that is rather interesting (including reviews of The Dain Curse from when it first came out, in 1929) and even where one doesn’t agree with the critics’ opinions, they are generally worth considering. I also bought from Mark a shorter book about Hammett, written by Julian Symons, who much admired the American author. Acerbic as ever, Symons is dismissive of The Dain Curse (and says that Hammett himself described it as ‘silly’). But by and large he gives an extremely positive set of insights into Hammett’s craft, whilst providing a sober account of the man’s life, which ended with a spell in prison, illness, and an inability to write. Very sad. Over the lifetime of this blog, there have been a few typos, but The Edukators is not one of them - nor is it a dig at declining educational standards. This is a German language film, which I watched with the benefit of sub-titles. It was a hit at the Cannes Film Festival and is directed by Hans Weingartner. The set-up is intriguing: the film opens with a wealthy family returning home to find that their lovely house has been turned upside down, and a message has been left for them by the intruders that seems to suggest the motive for the break-in was distaste for affluent lifestyles, rather than theft. This is at times a slow-moving film, but nevertheless it exerts a grip, and it certainly has an originality that lifts well out of the ordinary. The story concerns crime, but it is the relationships between the four main characters that are at the heart of the film. I wasn’t sure what to expect when I started watching The Edukators, but I’m glad I did see it, and I rather think it will linger in my mind longer than many more superficially entertaining blockbusters. I’ve mentioned before the guilty pleasure I take from the twisty mysteries of Francis Durbridge, and my latest contribution to Patti Abbott’s series of Forgotten Books is his 1960 book, The Scarf. I read it immediately after the new Kate Atkinson, and of course Atkinson is a much finer literary stylist than Durbridge. But he really could tell a story. This isn’t a Paul Temple thriller – the detective work is done by Detective Inspector Harry Yates of the Hertfordshire CID, a rather interesting cop, who is not afraid to bend the rules every now and then. Yates is a laid-back man who is quietly charismatic, and he needs all his wits about him when he is called to investigate the strangling of a young model and wannabe actress, Fay Collins. The murder weapon was the eponymous scarf, and soon – in a characteristic Durbridge touch – a scarf is sent to the police. But is it the one that was used to kill the girl? There is no shortage of potential suspects. These include Fay’s disabled brother, a farmer, an artist, a dressmaker and a tycoon. A teenage boy and the local vicar may also have something to hide. There are plot twists aplenty, and suspicion shifts rapidly from one person to another. As ever with Durbridge, we have a few scenes in night club, a setting which he obviously thought brimming with mysterious potential. The tycoon is suspiciously keen to fix up an alibi for the murder, but in due course his plans fall apart when the person chosen to provide the alibi is found dead. But who is the culprit? I enjoyed this unpretentious thriller, written by a highly accomplished craftsman. This song was written for a movie called La Piscine, about which unfortunately I know nothing. The vocals were done by Sally Stevens, and although Barbra Streisand performed a version of this song, I think Sally’s version stands up extremely well in comparison. I’ve known the name of Sally Stevens for many years, since she featured on a couple of excellent, if regrettably obscure, albums that Burt Bacharach turned out in the 70s, Futures and Woman. She co-wrote a song on the latter album, ‘There is Time’, and was a featured singer in a concert with the Edmonton Symphony Orchestra that I first saw almost 35 years ago. In that concert, she performed a song called ‘Charlie’ which has a quite superb melody – although a schmaltzy lyric. The only recorded version of it that I know is by Bobby Vinton, but that’s another song that should not be forgotten. In recent times, thanks to the wonders of online social networking, I’ve had the pleasure of getting to know Sally Stevens slightly, and have discovered that she has been working on new songs, and a possible new album. It will be worth listening to, of that I am sure, on the evidence of a couple of tracks that I’ve heard and much enjoyed. Sally tells me that she spent about ten years singing in concerts and on records fort Bacharach; there are few more driven perfectionists in the music business than him, and he certainly knows a fine singer when he hears one. Sally has been a terrific singer for a good many years, and I much look forward to listening to more of her work. In the meantime, Ask Yourself Why sees her in excellent form. I was very pleased the other day to receive a review copy of Adrian Magson’s new novel, Death on the Marais. It’s the first in a new series set in France and featuring Inspector Lucas Rocco, and it’s due to be published by Allison & Busby (who also publish my Lake District Mysteries) on 6 September. I gather that a follow-up title is due to appear in 2011. In this story, set in 1963, Rocco discovers the body of a murdered woman – in a military cemetery and wearing a Gestapo uniform. It’s an intriguing set-up and I’m looking forward to devouring the book just as soon as time permits. Adrian has emerged during the past few years as a prolific writer, both of fact and fiction. He has recently been involved in judging the CWA Short Story Dagger, and his occasional short stories are well worth seeking out. His articles frequently appear in writing magazines, and his Riley Gavin and Frank Palmer series, published by Creme de la Crime, has earned critical acclaim. He also writes a series about MI5 officer Harry Tate, published by Severn House. He was short-listed for the CWA Debut Dagger Award, and since he lived for some years in France, I would confidently expect his new book to have a very authentic setting. I am optimistic that Allison &Busby have picked a winner here. He identifies Holmes as the sole exception to this: he and Watson ‘are, first and foremost, characters, and the rest is incidental. At a guess, it is not impossible that Lord Peter Wimsey may one day qualify to keep them company.’ No mention of Poirot or Miss Marple here, and by the time Penny wrote this, Wimsey had solved his last major case! For Penny, plainly, the plot was the thing, and this was no doubt why, after the Second World War, he did not return to the genre: it had moved on, and elaborate puzzles of the kind he favoured were no longer in fashion. It is a shame that he abandoned the genre, though, since he (like the much more eminent Dorothy L. Sayers and Anthony Berkeley, who also gave up writing crime novels in the post-war era) had genuine talent as a writer, a talent which in his case never fully flowered. I suppose Penny would have been amazed had he been told that, more than seventy years after his debut novel was published, it has reappeared in a fresh and appealing version, courtesy of Ramble House. Of course, it is true that minor writers like Penny are forgotten by most readers nowadays, but the appeal of ingenious mysteries has by no means faded. The detective as a character, and the detective story as a form, have proved much more flexible, and thus enjoyed much greater longevity, than some of their creators over the years have anticipated. Patrick Hamilton was surely one of the most interesting British writers of the first half of the last century, and it has often surprised me that, for all the critical interest in the man and his work (there are two excellent biographies, plus an interesting memoir by his brother Bruce, himself a crime novelist of some distinction), Hamilton is seldom mentioned in histories of British crime fiction. Yet he is an important figure. One of his greatest successes was the play Gaslight, which in 1940 was turned into a film by Thorold Dickinson, with Anton Walbrook and Diana Wynyard in the lead roles. Four years later, there was a Hollywood version which apparently led to attempts to suppress, in effect, the earlier film, but this does not mean that the 1940 adaptation lacked merit. I’ve just watched it and felt that, even though it has a quaint feel at times, it was very well done indeed. There is a streak of cruelty in Hamilton’s work that I find slightly distasteful, but it does not mean that I don’t admire his work – I certainly do. He was a strange, and rather sad, man, and to some extent he exorcised his demons through his writing. This version of Gaslight is, even seventy years after it was made, still well worth watching. When I lived in Leeds for a couple of years in the 70s, the Yorkshire Ripper was at work, and my abiding memory is of how the serial killings terrified so many people, and interfered with the lives of so many women who were afraid to walk some of the city’s streets. It was a grim time, and there was real cause for celebration when, at long last, the police finally caught Peter Sutcliffe. Arguably, his arrest was delayed by the hoax letters and tapes sent to the police and which set them off on a false trail. I remember a massive advertising campaign about the tapes – and it was thought that, because of the accent of the voice on the recordings, that the Ripper came from Sunderland. In fact, Sutcliffe came from West Yorkshire, where most of his crimes were committed. Humble was asked what his motive was, and his answer was ‘notoriety’. A sick twist on the celebrity culture, I suppose. The programme was a sobering reminder of Britain’s biggest manhunt, and a shocking episode in our history. Humble appears in many ways to be a pathetic character, and by misleading investigators who had become desperate for a lead, it is arguable that his hoax cost the lives of a number of young women. How sad, and what a pointless waste of life. More than 25 years ago I watched the cult movie Diva, a French language film made in 1981. With the passage of time, I’d forgotten the details of the story-line, but I did at least recall that I’d rather enjoyed it, so I decided to give it another go. I’m glad I did. It’s a gorgeously made film, and it has a complicated plot, with perhaps too many turns for plausibility. This isn’t, first and foremost, a realistic film, but rather a movie that is stylish and studded with memorable scenes and setting. It marked the debut of director, Jean-Jacques Beineix, and is an impressive piece of work. The set-up is that Jules (Frederic Andrei) is a postman, who travels around Paris on his moped, while nourishing an obsessive devotion for black American opera singer Cynthia Hawkins. Although he’s an appealing character in many ways, his obsession makes him seem like a stalker at times. He makes a bootleg tape of one of Cynthia’s performances (she refuses ever to make a recording of her concerts), steals Cynthia’s gown, and pays a prostitute to wear it for him. It’s a tribute to the director and the actor that, despite all this, we want him to survive when he gets into trouble. And the trouble he gets into is serious. A woman who is being pursued by gangsters hides a cassette tape (which contains incriminating information about a criminal mastermind) in the postman’s moped. Confusion ensues between this tape and the bootleg of the diva’s singing. Jules finds himself pursued not only by the criminal mastermind and his thuggish accomplices but also by Taiwanese crooks who want to profit from recordings of Cynthia’s performances. How can Jules, who is both reckless and naive, possibly save his skin? The film is based on a book by Delacorta, whose work I haven’t read. But seeing this film made me wonder if it was time to track down his books and give them a try. Rupert Penny was one of the most interesting writers of the late Golden Age, and his 1937 debut novel, The Talkative Policeman, is my choice for today’s entry in Patti Abbott’s series of Forgotten Books. It is a book that was for many years almost impossible to find, but is now available at a modest price in a pleasing paperback edition, thanks to that splendid small press Ramble House, who have reprinted all the elusive Penny titles. Beale is rapidly called in by the local force when the Rector of the small village of Wyre is found murdered. He has been battered to death by a blunt instrument. Yet he seems to have led a blameless life – so what can possibly be the motive for the crime? Penny provides not one but two crime scene maps, and a miscellany of charts as a vast range of plot issues (including that old Golden Age stand-by, train times) are canvassed. The discussions are often very intelligent, and Penny (real name, Basil Thornett) was clearly a very smart guy – I gather he worked at Bletchley, the decoding centre, during the Second World War. I enjoyed the period feel of this book, but it became over-long and one of the key characters almost disappeared from sight, a structural weakness. I confess I failed the Challenge to the Reader (though I did prefer my own solution to Penny’s, that was no doubt due to prejudice on my part!) The criticism often made of this kind of book is, of course, that the author pays too much attention to complicating the puzzle, and not enough to characterisation and setting. But a ‘fair play’ puzzle does have much to commend it, in my opinion. Where this book suffers in comparison to the best of Christie, for instance, is that there is too much technical stuff, and an inadequately portrayed culprit and motive. But the journey towards the denouement is an agreeable time-passer and the book has genuine historic interest. The last two ports of call on my recent cruise were the capitals of Finland and Sweden respectively. I hadn’t done any research in advance, so I didn’t know what to expect of Helsinki. I thought it might be rather an anti-climax after St Petersburg. But in fact, I liked it very much. As always, a sunny day helped a good deal, and my only regret was not managing to fit in a boat tour round the city’s waterfront – always a good way to see a place. Such a tour was a real highlight of the final stop, at Stockholm. A full day’s excursion took in the Old Town (very appealing, if not quite as magical as Tallinn) and the Vasa Museum, featuring a rescued and restored ship, before a long journey around the waterways which provided a spectacular perspective on a very green and attractive-looking city. I’ve not read any Finnish crime stories, but of course Sweden has become a key location for some of the best and most popular books in the genre, something nobody would have foreseen a generation ago. I’ve had the impression of a rather melancholy place, a view perhaps inspired by Martin Beck’s ulcer and Wallander’s gloomy ruminations, and no doubt in winter, when the weather is cold and wet and the nights are long, it can be rather bleak. But last week, sunlit Stockholm seemed to me to be quite magnificent. Predictable to a fault, I’m afraid. As soon as I learned that St Petersburg boasted a notable ‘sight’ known as The Cathedral of Spilled Blood, my crime-writing instincts went into overdrive. Within hours, I worked out a story-line that would feature a cruise ship, a trip to St Petersburg, and – naturally – a trip to the cathedral. I duly followed in the footsteps of a group of characters whom I’ve so far only sketched out in my mind. The Cathedral is stunning, and so is St Petersburg. I have never been to Russia before, but this was one city I have long been keen to visit. It certainly lived up to expectations. We went on a boat tour of the River Neva and surrounding canals – not for nothing is St Petersburg known as the Venice of the North (though I later learned that Stockholm also claims that title). Our trip took us past the Winter Palace and the Hermitage Museum, although unfortunately time did not permit inside tours of those remarkable places. Another must-see was the Summer Palace, with its fabulous Amber Room, and the Tsar’s Estate. The drive out to Pushkin, where these sights are to be found, took us through some of the magnificent parts of the city as well as past some rather dour buildings and apartment blocks. My overall feeling was that the Russians seem to have managed the transition from the old regime to a new way of life with remarkable accomplishment. I don’t know many Russian people, but those I have come across have been, without exception, charming and cultured, and after this first sampling, I’d like to get to know their remarkable country better. Copenhagen was the first stop on my travels around the northern countries of Europe. I’ve visited Denmark three times now, and it’s a country which I find very appealing. So far, I haven’t read any crime novels set in Denmark, but this is an omission I’d like to put right soon. On this occasion we didn’t manage to make it to the Tivoli Gardens, but in the past I’ve found it a magical place – whether it’s ever featured in a Danish crime story, I don’t know. Is anybody able to enlighten me, please? Next stop was Wahnemunde, a resort port that basked in marvellous sunshine. We made the short trip to nearby Rostock, with its appealing waterfront. I’ve read quite a number of German crime novels, but I don’t think I’ve come across any so far set in former East Germany, though I’m sure there must be a number of books which take as their setting the fascinating and thought-provoking transition from communist to capitalist society. After that, a trip to Tallinn, capital of Estonia, and boasting a compact Old Town that I thought truly marvellous. Exploring this lovely city was possibly the unexpected highlight of the cruise. Again, it’s a place that once formed part of the Soviet bloc, but Tallinn seems to have adapted with great enthusiasm to western ways. I’ve not heard of any Estonian crime fiction, but even if the country lacks a Mankell or a Larsson, no doubt some good books set in this delightful part of the world will turn up before long! I’ve finally made it back from a truly enjoyable holiday cruising around the capitals of the Baltic. It’s been a period of relaxation and, to some extent, recuperation, and now it’s time to start catching up on the real world. My thanks in particular to those who commented on posts in my absence, and my apologies for not being better at publishing and responding to them – it proved trickier than expected to remain in contact via the internet for someone as technologically challenged as I am, and in the end I gave up and just enjoyed the sunshine. The great thing was that I had a chance to think out the final part of my current novel in progress, as well as coming up with some ideas for future stories – short and long. I can’t imagine any better way for a writer to recharge the batteries than to get away for it all for a few days, and allow imagination, rather than technology, to take charge. I visited some fascinating places and the research I did will, I’m sure, be very useful. One of the most agreeable holidays I ever had, to Venice, resulted in ‘The Bookbinder’s Apprentice’, my most successful short story, so it would be nice if something similar were to result from this trip. I’ve also done plenty of reading – even though I’ve not really made much of a dent in that massive to be read pile. The books I’ve devoured will be featured in this blog over the coming days. Suffice to say at this stage that the new Kate Atkinson is hugely entertaining, and the best book I’ve read in a while. Fiona mentioned Stacy Aumonier recently, in relation to his story ‘The Octave of Jealousy’, which has a structure reminiscent of La Ronde. I haven’t read it, but I’ve read one or two stories by Aumonier, who in the course of his short life (1888-1927) established a formidable reputation as a short story writer. Julian Symons was an admirer, and so was James Hilton, author of Goodbye, Mr Chips. Although Aumonier published six novels before TB cut short his life, there seems to be general agreement that he was better at the short form. There are a few writers, not just in crime, of whom the same might be said – not so much because there novels lack merit but rather because their gifts are especially suited to the short story. I’m tempted to put Arthur Conan Doyle in that category, and possibly G.K. Chesterton. In the modern day, names that spring to mind are those of Edward D. Hoch, Mat Coward and Jerry Sykes. Hoch in particular was a prolific short story writer – he produced close to 1000 – and only turned out novels sporadically. I enjoy writing both forms of prose. I’d rather be thought of as a novelist, I suppose, but it could be argued that, with one Dagger win and a further Dagger short-listing for my short stories, I’ve achieved at least as much recognition with the short form. One problem, of course, is that you can’t begin to make a living nowadays just from writing short stories. And that may mean that, in future, specialists like Aumonier will be very rare indeed. Which would be quite a pity. I’ve not seen many films directed by Mike Hodges other than the iconic Get Carter, but the pleasure of meeting him prompted me to take a look at another of his movies (which he also scripted) starring Michael Caine. Pulp is the story of a pulp fiction writer, British but based in Italy, who is hired to write the autobiography of a dying gangster (Mickey Rooney, of all people.) He becomes embroiled in the violence that lurks not far beneath the surface of his adopted homeland, and his efforts to play the hero in the manner of his fictional heroes are not exactly a roaring success. I suppose Pulp is best described as a comedy thriller, and striking the right balance between comedy and thrills is a very difficult trick to pull of indeed. There aren’t many successful examples – The Italian Job springs to mind, but few others. Hodges’ underlying purpose is serious, but I felt that the film sent out mixed messages. There were some excellent moments, and several witty lines, but for me, the ingredients did not add up to a completely satisfying whole. Viewed nearly 40 years after it was made, it simply seems too slow in places, and this is a pity, because there was a good story here, trying to make its presence felt. The cast is eclectic and includes Dennis Price (Kind Hearts and Coronets) as well as a newcomer, Nadia Cassini, who is very glamorous but does not seem to have made a lasting impact as a movie star. The background music was excellent, I thought, and as the credits rolled I discovered that the composer was George Martin, who was such an influence upon the Beatles. If you’re expecting another Get Carter, this isn’t really the film for you. Pulp has its merits, but I prefer a later Hodges movie about a writer. Croupier, starring Clive Owen, strikes me as more tightly written and much more gripping. Which I Never, by L.A.G. Strong, seems like a very suitable candidate for inclusion in Patti Abbott’s series of Forgotten Books. It was almost totally forgotten way back in 1980, when I first chanced upon it, when Collins Crime Club celebrated its Golden Jubilee by reprinting a dozen Crime Club titles from the past. The books were chosen by Julian Symons and he provided a short but valuable introduction to each volume. I’ve read three of the McKay books and agree with Symons that this is the best. The West Country setting is nicely evoked, and the plot kicks off with the unexplained disappearance of a girl who has become entitled to a music collection coveted by a man called Nosworthy. Symons is right when he refers to ‘the scattiness of the plot’, and some of the dialogue, though light and not over-done, is a bit too facetious for my taste. But it’s a pleasant story, if scarcely in the unputdownable category. Strong was a talented writer, despite the fact that he is now pretty much forgotten, and Which I Never remains an amiable read. Questions of identity fascinate me. People who want to solve their problems by becoming a different person, people obsessed with the lives of others – these ideas form a significant element in my books. Examples include The Coffin Trail, The Arsenic Labyrinth and The Serpent Pool. So naturally I was drawn to the concept behind the newish ITV series Identity. Identity involves a team of cops specialising in identity fraud cases. Keeley Hawes is the star, but there is strong support from a good cast, including Holly Aird and Aiden Gillen. The show was devised by Ed Whitmore, who was involved with Waking the Dead – a series which I saw only fleetingly, but thought not at all bad. My first encounter with Identity was an episode called Chelsea Girl. The set-up is excellent – a British girl called Olivia befriends another woman in Australia. But the new friend kills her, steals her identity, and catches a plane to England. Soon the cops are on her trail, and find that she is a woman with a troubled past. Now she is returning to her roots. This was a very fast-paced show, a thriller rather than a whodunit. The killer is quickly identified, and the only question was how much havoc the killer would cause before she was caught. The story-line was highly melodramatic, but it was entertaining, and I shall certainly take another look at Identity, as soon as time permits. Breathless is the English title for the famous Godard film A Bout de Souffle, which was at the forefront of the New Wave of film-making back in 1960. There was a re-make with Richard Gere in the lead role, which I haven’t seen, and I’ve only just watched the original, which stars Jean-Paul Belmondo and Jean Seberg. To call Breathless a thriller would be pushing things a bit, because it’s really a film that puts style above substance, and certainly above structure and plot. Belmondo’s character, Michel, is a petty criminal who, in a panic, shoots a police officer, and spends the rest of the film on the run. He is fascinated by an American girl called Patricia, played by Seberg, who at one point tells him she’s pregnant, and he is probably the father. The core of the film is about their relationship. What happens to Michel in the end is not exactly hard to predict. Yet this brief outline of the story does not do the movie justice. Michel is impressed by Humphrey Bogart, and studiously tries to be as cool as Bogey. Belmondo is a charismatic actor, and this was the film that shot him to international prominence. Seberg is lovely, yet rather flaky – she is fascinated by Michel, despite disappointing him in the end. I didn’t know much about Seberg until I read up about her after watching the film. Her real life seems to have been stranger than any fiction. She married frequently, became embroiled in controversy through her support for the Black Panthers, and committed suicide at the age of 40. Terribly sad. A title like The Price of Love suggests romantic fiction, but in fact The Price of Love is simply one of the entries in a crime story collection by Peter Robinson that I’ve just listened to on an audio book. And it’s quite a dark story, too, with nothing Mills & Boon about it at all. ‘Like a Virgin’ is especially noteworthy. It fills in the gaps of DCI Alan Banks’ past life- the main events are told in flashback, and concern a seedy murder case which he investigated in his London days, before decamping to rural Yorkshire, and Eastvale. It’s a good story, although one of the key clues was startlingly easy to spot. I must say I do like the way in which short stories can expand our understanding of a character familiar from a long series of novels. The collection is very varied, and it made for good listening. ‘Cornelius Jubb’ is set during the Second World War and deals with racial tensions, while ‘The Magic of Your Touch’ involves a supernatural element. Robinson is a very accomplished short story writer, and although - this is, I think, almost inevitable – the quality of the tales is a little uneven, overall they provide plenty of entertainment as well as sometimes provoking thought. There was a varied cast of readers – a good idea – and it included a number of class acts, such as Neil Pearson, whose voice seems, somehow, very well suited to Robinson’s writing. I’ve enjoyed Pearson as an actor for years, and he makes an excellent reader. I mentioned recently The Swedish Crime Story by Bo Lundin, which provides a concise but useful account of the genre’s highpoints up to 1980. It’s a short survey, and the book contains both the Swedish text and an English translation (which reads oddly in one or two small respects, but is otherwise okay.) Bo Lundin does not exactly have the critical or literary skills of Julian Symons, but all the same, I’ve found Lundin’s account very interesting. Lundin highlights two distinctively Swedish elements of crime fiction. One is called ‘the Trenter Syndrome’, named after its foremost proponent. Stockholm’s Stieg Trenter wrote books in which the atmosphere of his home city was as central to the book as the mystery itself. ‘The Ulcer Syndrome’ (named after Inspector Martin Beck’s troublesome ulcer in the books by Sjowall and Wahloo describes books with a strong sociological, although sometimes far from socialist, element. Lundin says: ‘There is a typical Swedish disappointment to be found in these books, an injured idealism...the big disappointment has its basis in a dream which once seemed close to fulfilment.’ In these books, settings are not so much used for local colour as for casting light on the characters. Lundin identifies the first real Swedish crime story as The Stockholm Detective, by Prins Pirre, published in 1893. I found it interesting that early Swedish crime writers studied Sherlock Holmes, Arsene Lupin, and Agatha Christie. Indeed, if Lundin is right, two books by Major Samuel August Duse anticipated The Murder of Roger Ackroyd. We already know that Anton Chekhov, no less, used an ‘acroidal’ plot in The Shooting Party. So perhaps The Murder of Roger Ackroyd was not quite as ground-breaking as everyone in the English-speaking world seemed to think at the time. Though I very much doubt that Christie knew the Pirre book, and probably not Chekhov's, either. When Fiona commented on my blog post about Colin Evans’ biography of Sir Bernard Spilsbury about the fascination of forensics, she suggested that I write a blog post about fingerprints. And in the spirit of interactivity and responding positively and enthusiastically to comments, I thought – good idea, I shall do just that! Fiona mentioned a personal connection with the history of fingerprints – she knew, in her youth, the daughter of Sir Edward Henry, who developed a classification system for fingerprints. What Fiona won’t have known is that, quite a few years ago, I mentioned Sir Edward in a story of mine. In fact, it was the very first Sherlock Holmes pastiche that I had published – ‘The Case of the Suicidal Lawyer’, which appeared in an anthology edited by Mike Ashley. Fingerprints only play a minor part in the story, but it’s a tale that I enjoyed writing so much that I’ve subsequently written several further Sherlockian pastiches. And I’ve been asked to write one or two more recently, but to my regret, work commitments have prevented me from doing so. I hope to get back to Sherlock, and perhaps the early days of forensics, before too long. There are plenty of good books that deal with fingerprint evidence. One to which I refer from time to time is by Ian K. Pepper, Crime Scene Investigation: Methods and Procedures. The book covers a wide range of topics, and the chapter on fingerprints is especially useful. Ian, who lectures on the subject, is married to Helen Pepper, who also has great experience in forensics, and who has helped me on technical issues when writing a couple of my Lake District Mysteries. One of the pleasures of attending CWA conferences, incidentally, is the opportunity to learn more about forensics and crime investigation. 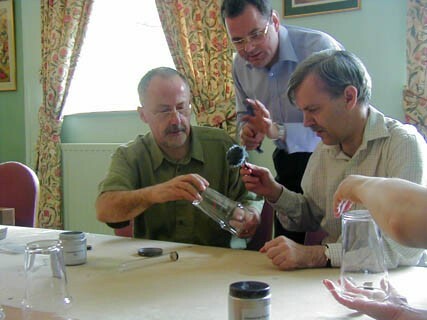 Over the years, we have had many interesting sessions, including one about fingerprints. And the photo was taken a few years back, at a conference at Appleby in Cumbria (lovely town, by the way). Ian Pepper is in the picture, explaining things to Russell James and me. That was the day I bought Ian’s book, and I’m glad I did. I first came across Paul Johnston on a memorable evening at the Law Society in Chancery Lane – was it as long ago as 1997? - on the occasion of the CWA Awards Dinner. I was there, among other reasons, because I’d edited an anthology which yielded a couple of candidates for the short story Dagger. That evening, one of those writers, Reg Hill, won the Dagger for his brilliant story ‘On the Psychiatrist’s Couch’, while Paul won the John Creasey Memorial Dagger for his first crime novel, The Body Politic. In those days, Paul was published by Hodder, a company to whom I’d just moved, when they acquired The Devil in Disguise as the first instalment of a two-book deal. Our paths crossed a few times after that, and I remember a very agreeable Hodder authors’ dinner in Manchester which we both attended, during a Dead on Deansgate conference. Paul’s early books featured Quintilian Dalrymple, and later he wrote about a half-Greek character, Alex Mavros. But he, like me and a number of others, parted company with Hodder, and he had to cope with serious illness – he’s come through two unconnected bouts of cancer in the past five years. Fortunately, he came back triumphantly with an interesting newish publisher, Mira, who specialise in mass market thrillers. He now divides his time between Athens and the UK and I bump into him occasionally at conventions. His latest book, Maps of Hell, is the third mystery starring Matt Wells, who first appeared in a dynamic thriller called The Death List, which was all about payback, in more ways than one. It is published by Mira on 6 August, and it will be worth watching out for, because Paul Johnston is a writer of genuine quality. Last year, I included in Patti Abbott’s series of Forgotten Books the notable first novel by Stanley Hyland, Who Goes Hang? Today I’m highlighting another of his books, Green Grow the Tresses-O, which was first published in 1965, at which time Hyland lived and worked on the periphery of politics, producing political broadcasts for television, as well as being involved with a wide range of other TV shows. Because Hyland was a busy man, he did not have much time for novel writing and he only wrote three novels in all; I found Top Bloody Secret, which involved the secret services, only so-so. But Green Grow the Tresses-O is a short and snappy story, which benefits from a dramatic opening, with the discovery of that a blonde Italian girl has met a messy end in the machinery in a Yorkshire mill. It’s very different from Who Goes Hang? Yet I think it’s at least as good, even if not as well remembered nowadays. From there, a mystery involving an element of international intrigue develops. A high-security American base is near to the mill – is there a link with the killing of Gina Mazzoni? And is the unsolved murder of another girl two years ago connected? This is an enjoyable story with some nice humour and a good final twist. Although he moved to London to pursue his career, Hyland was a Yorkshireman, and he portrays the people of his home county entertainingly and well. It is a pity that he did not have more time to devote to the genre – he definitely had a talent for it. The Father of Forensics, the biography of Sir Bernard Spilsbury that I covered in this blog recently, has a new true crime book out, again published by Icon. Slaughter on a Snowy Morn deals with a much less familiar subject, an American case that I had never heard of before this book arrived on my doorstep. Evans, who clearly has a great passion for forensic science, concludes that the Stielow case sounded ‘a warning bell about the dangers of junk science’. It also represented a milestone in American jurisprudence: ‘for the first time, scientific testimony helped to overturn a murder conviction’. The story is, for Evans, a conspicuous example of the power of human outrage in the face of injustice. If you are a true crime fan, then I think you will find Evan’s work interesting. This book didn’t appeal to me quite as much as The Father of Forensics, perhaps mainly because of my great interest in Spilsbury and his important role in the Crippen case, which I retold in Dancing for the Hangman. But it’s good to know something about a case of which I was previously unaware. L.C.Tyler’s The Herring-Seller’s Apprentice attracted a good deal of well-deserved attention, introducing as it did two very entertaining characters, unsuccessful crime writer Ethelred Tressider and his long-suffering agent Elsie Thirkettle, in a story which paid agreeable homage to the Golden Age mystery. Tyler’s fourth novel, and his third featuring Ethelred and Elsie, has just been published, and I’ve certainly enjoyed reading it. You can tell from the pleasing title of The Herring in the Library that again we are in Golden Age territory. Here, Ethelred’s old friend Sir Robert Muntham is found dead in the library of Muntham Court, after a dinner attended by Ethelred, Elsie, and a host of people who had reason to wish Sir Robert harm. The present day narrative is accompanied by extracts from one of Ethelred’s historical mysteries, featuring Chaucer’s sidekick Master Thomas, investigating a crime which has curious parallels with the case of Sir Robert. Tyler manages, therefore, to poke fun at two different kinds of detective story in the course of one novel. There are plenty of jokes, as well as a witty finale, and I can imagine the author’s delight in having Sir Robert’s comely widow saying to Ethelred, ‘I’ve always found crime writers irresistibly attractive. Most women do.’ Alas, it’s a reminder that this is a work of inventive fiction! I am a Len Tyler fan, and his work is one of my favourite discoveries of the last few years. This is another very agreeable read. I’ll be travelling for a few days, but I’ve scheduled blog posts for each day of my absence, so there will be plenty of varied reading matter for regular visitors to ‘Do You Write Under Your Own Name?’ However, it may be difficult for me to access a pc while I’m away, so please forgive me if I take longer than usual to post or reply to any comments. It’s been a year since I’ve had a real holiday and I have to say that I’m looking forward to this one, even though no doubt – as usual – it will prove all too brief! Today would have been my mother’s birthday; for many years, she came along for the summer holiday, so that we could celebrate with her in style. This is the first time she hasn’t been around, but I’ll be thinking of her. And thinking, also, of the mystery novels in which she and I shared enjoyment for many years. She was a great Dorothy L. Sayers fan, and so I became one too. Her favourite was Gaudy Night, but mine is a near-tie between The Nine Tailors and Murder Must Advertise. I would also put in a word for The Documents in the Case, a very interesting experiment in mystery writing, if not a complete success. Neither of us cared for Five Red Herrings, a rather plodding mystery, but at least the Galloway setting is well evoked. And I'm honoured to say that I've just been invited to give the 19th Dorothy L. Sayers Lecture next year, as part of the Essex Book Festival, by the Dorothy L. Sayers Society. Not sure what to speak about yet, but plenty of time to prepare! The Blind Banker, second episode in Sherlock, starring Benedict Cumberbatch and Martin Freeman as Holmes and Watson, was my first encounter with the 21st century version of Conan Doyle’s classic detective duo. I missed A Study in Pink last week, but reviews were very positive, and I can see why. The idea of updating the characters but retaining key elements from the originals was the brainchild of Steven Moffatt and Mark Gatiss, two very good TV writers. Purists might wince at the idea, but it seems to me that, crucially, the series respects the aspects of Conan Doyle’s stories that made them so memorable. The Blind Banker, certainly, was much more than capable pastiche. The story was written and acted with a great deal of flair. The story kicks off with the appearance of a mysterious cipher at a City bank. Shortly afterwards, one of the senior bankers is found dead. A journalist dies in similar circumstances. Both men, it turns out, had recently travelled to China. What is the connection, and how can the cipher be decoded? The story contained various elements of Golden Age detective fictions – locked rooms, ciphers, mysterious foreigners – and the script was full of witty asides. The two leading men are splendidly cast and I love the idea of Una Stubbs as Mrs Hudson. Sherlock is different from Jonathan Creek, but not totally different. Again, we have the updating of traditional crime fiction, done with wit and ingenuity. I really enjoyed this episode. Recommended. James Lee Burke is a writer with a gift for creating atmosphere, and his work seems eminently suitable for adaptation to the big screen, so I expected great things from In the Elecric Mist, a 2009 film based on one of his Dave Robicheaux novels, and starring the excellent Tommy Lee Jones as Dave – a brilliant piece of casting. The story-line is quite complicated. A young woman’s body, sadistically mutilated, is discovered, apparently the work of a serial killer. Soon afterwards Dave has a chance encounter with a man and woman who are involved in making a film set at the time of the American Civil War. The man tells Dave that he has come across some human remains, and this news takes Dave back to his youth, when he witnessed the shooting of a black man. After a series of plot twists – and Dave’s surreal encounter, after he has taken a drug-laced drink, with a Confederate soldier – he latches on to the identity of the serial killer. The final section of the film is exciting. Dave’s daughter is kidnapped by the bad guy, and the various plot strands are pulled together pretty well. The trouble is that the first part of the film moves rather slowly, and the viewer’s enthusiasm may have waned before the action really kicks in. A pity, because Tommy Lee Jones puts in a compelling performance. I enjoyed the evocative representation of the steamy Louisiana setting of the story, and I’m glad I watched the film. However, it’s not the masterpiece I hoped for, because of that early lack of pace, and a diffusion of interest because of the disparate elements of the story-line. Decent viewing, but in some ways a missed opportunity.